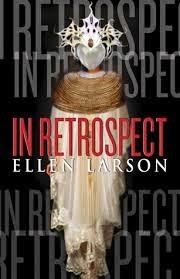 Ellen Larson, In Retrospect. Five Star Publishing, 2013. ISBN 978-1-4328-2733-5. $25.95. Aliya Whiteley, Witchcraft in the Harem. Dog Horn Publishing, 2013. Pp. 132. ISBN 978-1-9071334-0-4. $12.61. 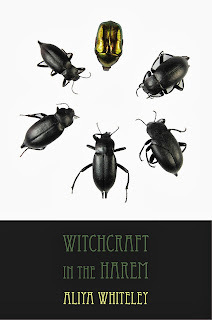 Witchcraft in the Harem, by the UK-based author Aliya Whiteley, was published by Dog Horn Publishing earlier this year. This is a well-crafted collection of seventeen stories that were originally published in different magazines and anthologies between 2003 and 2012. Though one of the dominant themes is motherhood, the book has a broad range of themes and plots, and travels across all the speculative genres. 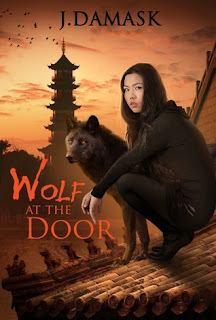 The majority of the main characters in the stories are women and they deal with issues like the awful husband, the boyfriend, the unwanted child, the yearn for a child, the boss, the mother, the miserable life as housewife and so on. It might sound trivial, but these are some of the best stories I have read for quite a while. These tales are weird, terrifying, beautiful, disturbing and funny. They are exceptionally well written and very entertaining. 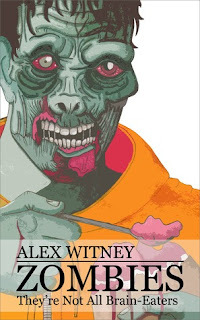 Alex Witney, Zombies: They're Not All Brain-Eaters. DMPP, 2013. Pp. 170. ISBN 978-1-4839527-6-5. £2.99 (kindle)/£6.99 (paperback). This is a novel that relies very much on the ground-breaking themes of previous popular self-referential modern fantasy and sci-fi, as well as notable cult favourites, and it knows it. With direct shout-outs to zombie films, Beetlejuice, The Hitchhiker’s Guide and even Dr Who (I think), among others, this is a ‘post modern’ take on zombies. Ho, ho, ho, let’s make a zombie-human buddy book, eh? The reader is encouraged to pick up the idea and run with it. To do him credit, Witney does do this with a cheeky wide-boy charm that makes for a fun, if uneven, read. Rhys Hughes, The Abnormalities of Stringent Strange. Meteor House, 2013. Pp. 205. ISBN 978-0-9837461-3-3. $25.00. We begin pre-WWII, the heady days of America in 1930s, when it was just starting to discover its gung-ho attitude. Stringent, a test pilot of great skill and odd appearance is about to witness the kidnapping of his adoptive father and professional mentor, Professor Crinkle, by a batch of ‘proto-Nazis’ (‘proto’ signifying the full-blown WWII kind, although, historically, they are already in power in Germany at this stage). 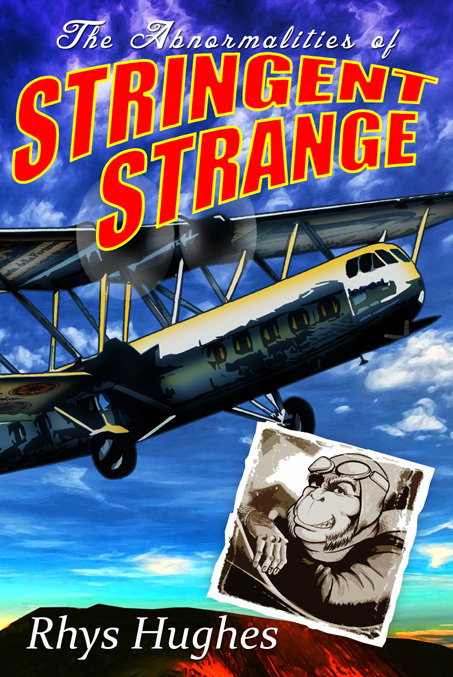 The ‘proto-Nazis’ want different aeronautic genius, but snaffle Crinkle under a case of mistaken identity. Desirous of getting his father back, Stringent flies an experimental, chronologically-powered plane a little too fast and powers into an alternative future—around 200 years into the future, to be precise. In a world of strange beings, stranger cyborgs and interplanetary high-jinks, Stringent will set course for an improbable adventure to find a super-gun to fend off an alien invasion, travel the exotic forests of deepest Africa, and satisfy a planet of nymphomaniacs, while his travelling companions do gladiatorial combat for the entertainment of extraterrestrial dinosaurs, fighting against resurrected writing legends. 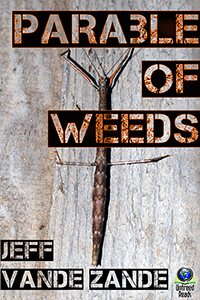 Jeff Vande Zande, Parable of Weeds. Untreed Reads, 2013. Pp. 51. ISBN 978-1-6118759-3-5. $1.99. Zande’s powerful novella is of grave social warning, and for its size, it carries one hell of a wallop. In the future, in what amounts to a two-tier social system, dystopian for the greater number of have-nots, Ian is an over-worked marketing analyst in a global conglomerate, his life a blur of red-eye flights, hotels and presentations. A widower, his only son is growing up without him in a secure, high-end community. A chance meeting on a plane and an even chancier adoption of a homeless, hungry man beyond the wall that surrounds his commune forces Ian to start showing alarmingly human emotions of compassion and curiosity in a regulated, desensitised world He starts to take terrible risks that could bring his hard-won world crashing down around his ears.